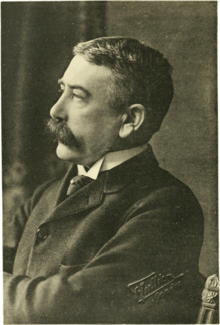 Ferdinand Mongin de Saussure (/sɔːˈsʊər/ or /soʊˈsʊər/; French: [fɛʁdinɑ̃ də sosyʁ]; 26 November 1857 – 22 February 1913) was a Swiss linguist and semiotician. His ideas laid a foundation for many significant developments both in linguistics and semiology in the 20th century. He is widely considered one of the founders of 20th-century linguistics and one of two major founders (together with Charles Sanders Peirce) of semiotics/semiology. He was born in Geneva in 1857. His father was Henri Louis Frédéric de Saussure, a mineralogist, entomologist, and taxonomist. Saussure showed signs of considerable talent and intellectual ability as early as the age of fourteen. After a year of studying Latin, Ancient Greek and Sanskrit and taking a variety of courses at the University of Geneva, he commenced graduate work at the University of Leipzig in 1876. He taught at the École pratique des hautes études for eleven years during which he was named Chevalier de la Légion d'Honneur (Knight of the Legion of Honor). When offered a professorship in Geneva in 1891, he returned. Saussure lectured on Sanskrit and Indo-European at the University of Geneva for the remainder of his life. It was not until 1907 that Saussure began teaching the Course of General Linguistics, which he would offer three times, ending in the summer of 1911. He died in 1913 in Vufflens-le-Château, Vaud, Switzerland. His brother was the Esperantist René de Saussure, and his son was the psychoanalyst Raymond de Saussure. Saussure's theoretical reconstructions of the Proto-Indo-European language vocalic system and particularly his theory of laryngeals, otherwise unattested at the time, bore fruit and found confirmation after the decipherment of Hittite in the work of later generations of linguists like Emile Benveniste and Walter Couvreur, who both drew direct inspiration from their reading of the 1878 Mémoire. Saussure also had a major impact on the development of linguistic theory in the first half of the 20th century. His two currents of thought emerged independently of each other, one in Europe, the other in America. The results of each incorporated the basic notions of Saussure's thought in forming the central tenets of structural linguistics. His status in contemporary theoretical linguistics is much diminished, with many key positions now dated or subject to challenge, but post-structuralist 21-century reception remains more open to Saussure's influence. While a student, Saussure published an important work in Indo-European philology that proposed the existence of ghosts in Proto-Indo-European called sonant coefficients. The Scandinavian scholar Hermann Möller suggested that they might actually be laryngeal consonants, leading to what is now known as the laryngeal theory. It has been argued that the problem that Saussure encountered, trying to explain how he was able to make systematic and predictive hypotheses from known linguistic data to unknown linguistic data, stimulated his development of structuralism. His predictions about the existence of primate coefficients/laryngeals and their evolution proved a resounding success when Hittite texts were discovered and deciphered, some 50 years later. Saussure's linguistic ideas are still considered important for their time but have suffered considerably subsequently under rhetorical developments aimed at showing how linguistics had changed or was changing with the times. As a consequence, Saussure's ideas are now often presented by professional linguists as outdated and as superseded by developments such as cognitive linguistics and generative grammar or have been so modified in their basic tenets as to make their use in their original formulations difficult without risking distortion, as in systemic linguistics. That development is occasionally overstated, however; Jan Koster states, "Saussure, considered the most important linguist of the century in Europe until the 1950s, hardly plays a role in current theoretical thinking about language," More accurate would be to say that Saussure's contributions have been absorbed into how language is approached at such a fundamental level as to be, for many intents and purposes, invisible, much like the contributions of the Neogrammarians in the 19th century. Over-reactions can also be seen in comments of the cognitive linguist Mark Turner who reports that many of Saussure's concepts were "wrong on a grand scale". It is necessary to be rather more finely nuanced in the positions attributed to Saussure and in their longterm influence on the development of linguistic theorizing in all schools; for a more recent rereading of Saussure with respect to such issues, see Paul Thibault. Just as many principles of structural linguistics are still pursued, modified and adapted in current practice and according to what has been learnt since about the embodied functioning of brain and the role of language within this, basic tenets begun with Saussure still can be found operating behind the scenes today. Saussure is one of the founding fathers of semiotics, which he called semiology. His concept of the sign/signifier/signified/referent forms the core of the field. Equally crucial but often overlooked or misapplied is the dimension of the syntagmatic and paradigmatic axes of linguistic description. Instead of focusing his theory on the origins of language and its historical aspects, Saussure concentrated on the patterns and functions of language instead. Although the name has been changed to semiotics, his theory is still commonly used in today's society. He also believed that the relationship that exists between the signifier and the signified is purely arbitrary and analytical. Some linguists have pointed out to the fact that Saussure did not 'invent' semiotics but built upon Aristotelian and neoplatonist knowledge from the Middle Ages, particularly in regard to the writings of Augustine of Hippo: "as for the constitution of Saussurian semiotic theory, the importance of the Augustinian thought contribution (correlated to the Stoic one) has also been recognized. Saussure did not do anything but reform an ancient theory in Europe, according to the modern conceptual exigencies". ↑ Munteanu, E. 'On the Object-Language/Metalanaguage Distinction in Saint Augustine's Works. De Dialectica and de Magistro. ', p. 65. In Cram, D., Linn, A. R., & Nowak, E. (Eds.). History of Linguistics 1996: Volume 2: From Classical to Contemporary Linguistics. John Benjamins Publishing Company. Retrieved April 16th 2015 from https://books.google.com/books?id=IWtCAAAAQBAJ&pg.